Care to "set off" your GTO, Monaro or VXR8 from the rest? Reminiscent of the '69 GTO "The Judge", these retro style graphics will do the trick. This easy-to-install precut six (6) piece graphic kit is designed to follow your GTO/Monaro/VXR8's top body line and breaks off to the rear as shown. Graphics are precut with no trimming required, except for one easy cut at the Fuel Door. 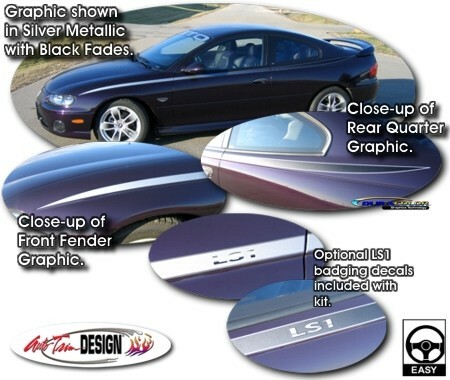 This graphic set will fit any '04-'06 Pontiac GTO or '01-'07 Holden/Vauxhall Monaro/VXR8. Available in four (4) different color schemes. As an extra step, graphic pieces are over-laminated with a 2.5 mil clear laminate which will protect the graphics from miles of abuse. 'Click' Here to view color schemes.